Allegorithmic has released the first update of 2018 for Substance Painter, bringing with it a stylish new user interface and a host of performance enhancements. 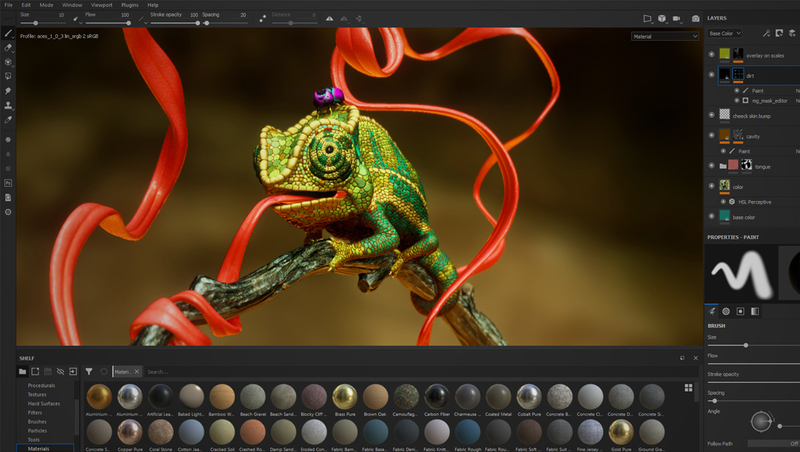 The new look simplifies the painting experience, offering 15 major improvements targeting everything from toolbars and windows, to the amount of viewport space. As 3D painters often paint from varying degrees of closeness, the new UI can be scaled up to 90 percent of the viewport, allowing artists to customize the interface according to their creative preference. As they work, new toolbars, widgets and windows will help them be efficient, providing easy access to shader parameters and tool settings. Defaults have also been installed to make the UI more intuitive to users of every skill level. Performance improvements will affect the entire creative process from start-up to save. Shelf loading sees the biggest gains, helping users load smart materials, brushes and presets as much as six times faster. The experience of tablet painting has been enhanced, ensuring a higher fidelity transfer of external gestures. In order to improve the efficiency of the process, new sliders and color-grayscale bars developed for tablets have also been added, a move that mimics a general principle of the release where all tools — for tablets or otherwise — will now be accessible with a simple click.